For any of you that have ever played Flying Buffalo Starweb game, I would suggest that you take a good look at the Starweb Analyzer. It revolutionizes the way the game is played. The Starweb Analyzer is a utility that provides a completely new user interface for playing the play-by-mail game Starweb. Although is an awesome game, the game turns that you get either by e-mail or snail mail leave much to be desired. Snail mail players are on your own, but if you get your turns sent to you via e-mail (which is now the preferred way that FBI wants it), the Starweb Analyzer will launch you into the new millennium. 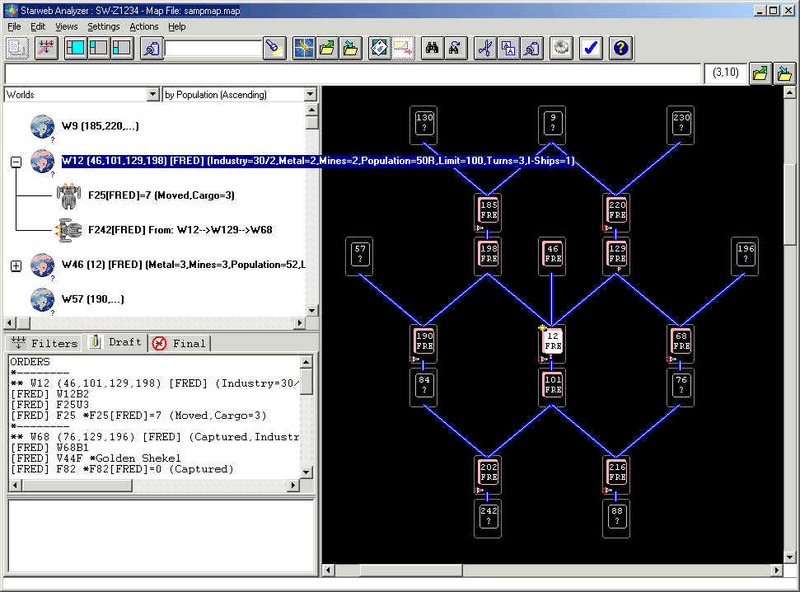 The Starweb Analyzer takes the Starweb turns that FBI sends you, and processes them so that they are combined together and presented in an Analysis Window, an easy to use Graphical User Interface that allows you to view an manipulate one master turn that combines all known information that you have accumulated. The Starweb Analyzer keeps track of worlds no longer seen on the current turn sheets and labels what turn they were seen last. Various filtering and sorts can be used to manipulate the combined information to find those important things you want without having to study a printout for hours. For example, finding the largest metal stockpile within three worlds of your home world is done easily. If your allies don't have the Starweb Analyzer (shame on them!) you can generate reports for them in a text file suitable for printing or e-mail. Save the map as a bitmap image file to send to your allies. embedded e-mail support to make sending your orders to FBI or allies a snap. The Map View which eliminates the need for paper and pencil and those messy spaghetti maps that plague us in the game. The map supports mouse controlled drag and drop to move worlds around. It handles wrap-around worlds easily and you can save the map as a text file suitable for e-mailing to an ally. Your ally just plugs the map file into the Starweb Analyzer program and the same map appears. The Analyzer also offers an intelligent Order Editor that allows you to prepare your orders for submission to Flying Buffalo Inc. The orders are checked for typographical errors as well as many logical errors. Only valid Starweb orders will be accepted. It will not allow orders for keys or worlds that you do not own and checks for mutually exclusive orders, valid world connections, as well as orders that exceed your resources (for example it would warn you if you tried to transfer more ships than are on a key). The Order Editor allows you to save this file and revisit it at any time for revisions. A prompting feature helps to construct the orders without having to refer to the Starweb reference manual for help with the cryptic order syntax.